Built 1908-1909. Opened 4 Dec 1909 with the Vicent Lleó's zarzuela "Los hombres alegres". From 1918 more and more used as a cinema. 1968 major rebuilding of the facade. From the 1980s, used as a bingo hall. 2013-2014 converted to a casino, renamed "Gran Casino Teatro Balear". 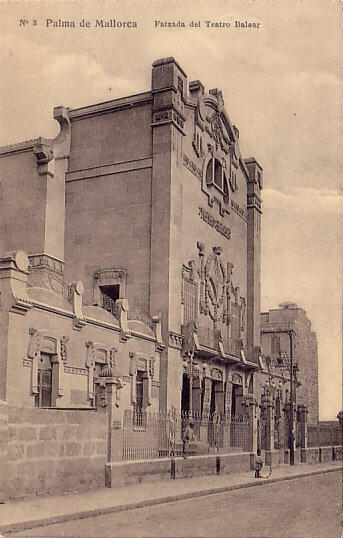 Front Text: "Palma de Mallorca - Fatxada del Teatro Balear"